NB. Please be aware that this text was translated from early short Latin and in its day some words had many meanings and are not shown here as type errors. 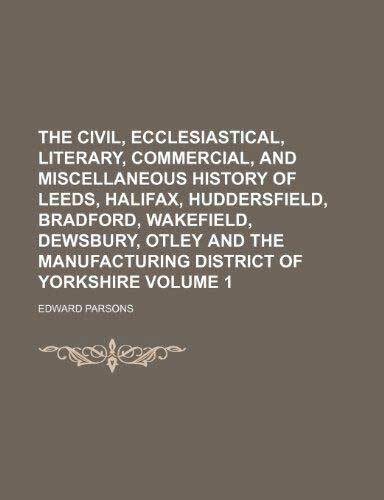 The civil, ecclesiastical, literary, commercial, and miscellaneous history of Leeds, Halifax, Huddersfield, Bradford, Wakefield, Dewsbury, Otley and the manufacturing district of Yorkshire – Volume 1. Methley is a very ancient village or rather town. In the Saxon times it was respectable if it was not important. One very interesting relic of those times still remains. It is the statue of king Oswald, the patron saint of the place, over the south door of the church, with which it is most probably contemporary; it represents the figure of a venerable man in robes, with a sceptre and a crown, and though it is considerably decayed it is still in good preservation when its very high antiquity is considered. * According to the principle of calculation then which we have adopted in this work, Methley had at this period a population of two hundred and twenty, or two hundred and thirty souls. In what method the manor of Methley was conveyed to the hospital of St. Nicholas at Pontefract, it is impossible to ascertain, but that it had been granted to that foundation is indubitable, since a licence was granted in the eleventh year of the reign of Henry IV. to the master of the house in question, to exchange this manor with Sir John Waterton for certain advowsons. The Watertons very soon made Methley the place of their permanent residence. The following is the manner in which Methley was transferred from the family of the Watertons. The last Sir Robert Waterton, who lived in the reign of Edward IV. had no issue, and his estates devolved to his sister lady Welles, who had four coheiresses. One of these coheiresses was married to Sir Thomas Dymoke, knight, who in the distribution of the estates became seized of the manor of Methley; how it passed from the Dymokes cannot be ascertained, but in less than a century after the event to which we have alluded, it became the property of the Saviles, with whom it still remains. Of the residents at Methley, and their immediate connexions, some interesting particulars may be gleaned from the records of bygone days. One of the Sir Robert Watertons, who distinguished himself by founding the chapel which bears his name, in Methley church, was one of the most prominent characters of his age. After having served Richard II. he became master of the horse to Henry IV. and he was one of the knights who with Sir Thomas Rokeby arrested the progress of the insurrection of the Earl of Northumberland, which terminated in the defeat and death of that ambitious nobleman on Bramham Moor. Lionel Lord Welles, who prominently engaged in the sanguinary wars of the Roses, and who was slain at the battle of Towton, was brought to Methley to be interred, and his memory is commemorated by a splendid tomb, upon which his representation reclines in the church. When the Saviles obtained possession of Methley, their house was often the abode not only of hospitality, but of learning, and some of the members of this family rendered Methley the concentration of intelligence and liberal inquiry. A striking and a pleasing proof of this is afforded by a letter among the Strafford papers, from Sir Henry Wotton to the Earl of Strafford, then Sir Thomas Wentworth, in which he informs him of the fulfilment of a promise in having borrowed for him from the celebrated John Hales of Eton, Dutravius de Piscinis, a piece of rural philosophy, on which he says they had conversed at Methley, and he speaks with great delight of the Methley Triplicily, of which Henry Lord Clifford formed one. * This language proves that the then resident at Methley must have been a man both of knowledge and of taste, and implies a pleasing communion of literature and of comparative elegance, in an age when not many of the English nobility were devoted to the muses. Of this family we can only add at present that Sir John Savile, of Methley hall, was created baron Pollington of Longford in Ireland, in 1753, and Earl of Mexborough in 1765. The title still remains in the family. “Methley Hall,” continues the same writer, *’ stands a little to the west of the town and church of Methley. This was a fine old house built originally by Sir Robert Waterton, in the reign of King Henry IV. but afterwards great part of it was rebuilt in the time of Queen Elizabeth, by Sir John Savile the Judge. It was moated round, and had a stone bridge over the moat to a tower in the centre of the front, where was a gateway or entrance with strong gates like a castle, and a portcullis to let down in time of danger. On the opposite side of the house was a drawbridge over the moat. The house was built like a castle round a square court. In the front were three towers, that in the middle through which the grand entrance was, and another tower at each end of the front, in one of which was a ring of bells. But the house having gone out of repair by reason of the moat, the late Earl of Mexborough pulled part of it down and built much in the modern taste. There is a good park and well stocked with deer.” * This old hall, Thoresby, who incidentally refers to it in his account of Potter Newton, calls it “a curious house at Medley, which was it within my limits, merits a particular description, especially the celebrated long gallery, in the windows of which are painted the arms of the Yorkshire nobility as they were in Elizabeth’s reign,”-and then he justly adds “that this ancient and honourable family has obliged the world with many eminent and learned persons.”. The gallery of which Thoresby speaks in this passage has been pulled down, and a modern front has been erected, distinguished by a simplicity not often discovered in mansions of a similar dignity and extent. Some of the interior apartments are very superb, all the arrangements are magnificent and convenient, the hall and the back part of the house retain all the interesting characters of antiquity, and the range of park in front of the grand entrance, bounded by very extensive woods, is one of the finest in the county. The whole domain of Methley displays a softened, chastened, and luxuriant beauty rarely equalled in this part of the country. The village has lost much of its character as described by Gough, although there are still some respectable houses in its vicinity: some of the buildings are very ancient, the house fronting the road from Leeds, and standing near the church, is a perfect picture of a country inn of the olden time, the surrounding country is rich and cultivated to the highest possible degree, and some gentle slopes and undulating hills prevent that monotonous aspect of dead and unvarying level, which characterises so many of the most fruitful provinces of England. The beauty of the country is materially increased by the approach of the two great rivers Aire and Calder to the junction of their waters, which takes place at Castleford, about a mile and a half from Methley. The retirement of Methley has been somewhat invaded, though its convenience has been materially subserved, by the formation of the new Leeds, Pontefract, and Barnsdale turnpikeroad, which was opened July 13, 1822, and diminishes the distance of the former road between Leeds and Doncaster more than four miles. It was constructed under the superintendence of Mr. M’Adam, so celebrated for his new system of making and repairing roads and thoroughfares. This entry was posted in Methley Historical Events and tagged edward parsons, history of leeds, parish of methley, sir edward waterton.